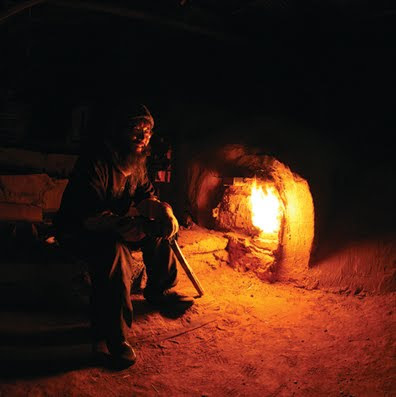 If you have never sat alone firing a wood kiln on a cool night when the wind is still and the only light comes from the flame, heating - almost burning - your face, you have never experienced the most spiritual moments of being with clay. There is nothing like it. The river of flame flowing through the ware, touching the surfaces with both heat and ash, perhaps gentle at first and for some never gentle. For others, a fierce flame dancing, darting not kissing but more like passionately embracing the ware - fire is. Park Jong Il's kiln is an orumgama - a chambered climbing kiln - just large enough for one person, with occasional help, to manage during the thirty hours needed to reach 1260C (2300F) for the glaze firing. Of course the wood must be cut well ahead of time. If you were to visit these mountains in the early 1980's, just thirty years ago, they would be nearly bare as all of the trees were cut and shipped to Japan during the Japanese occupation. Today there is new growth and wood is plentiful. Still potters today scrounge for any scrap wood they can find to use in their firing especially during the early heating or candling stages. Look closely and you can see the ax used to split the logs. Chopping wood is a long and laborious task. Black and red pine are used. Pine in Asia is not a soft wood like in the United States it is a hard wood and the preferred wood for firing. The firebox is long and set below ground. During the glaze firing it is fired for 20 hours. After the fire box has heated the kiln the chambers are fired for approximately 3 hours each to reach the final glaze temperature. No cones are used to determine the proper glaze melting temperature. That determination is made by eye. The color of the heat and the use of a metal rod that allows one to watch the fire shadow on the ware are the main methods used. In addition small tea cups are placed near the peep hole. When the glaze melts on these cups, the potter is assured that the proper temperature has been reached. I have seen other potters roll small coils of glaze that are dried and placed in wads of clay to help determine the glaze melting point. Others place rings of clay dipped into glaze into the kiln. These are drawn out with a metal rod to determine if the glaze temperature has been reached. Prior to the glaze firing there is a bisque firing in the same kiln. 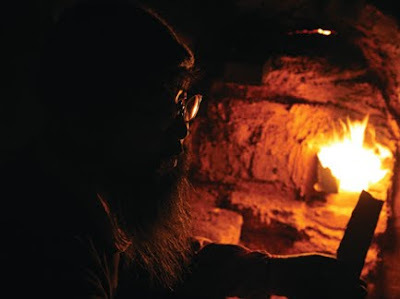 The firebox is fired for 5-6 hours and each chamber is fire 1 or 2 hours to reach 800C (1472F) for stoneware or 900C (1652F) for a porcelain bisque. Remember that Park Jong Il lives high in the mountains. 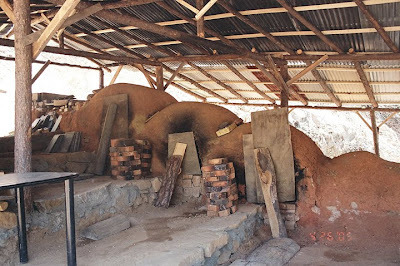 His Kiln is 500 meter above sea level and slopes at an 18˚ angle. Most Korean kilns slope at a 16˚ angle. The slightly steeper slope helps Jong Il reach temperature more easily. 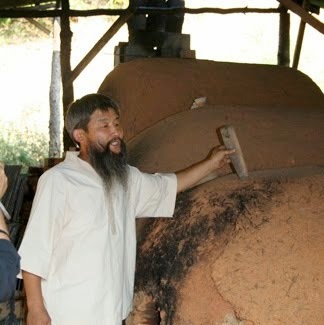 Jong Il demonstrates the construction of the arch in this ancient style kiln. It is a mangdaengi "망댕이 가마". So named because of the type of brick used in the construction of the dome. 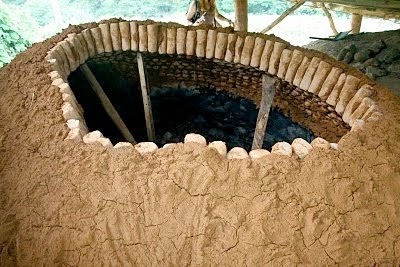 This type of kiln predates the Imjin War with Japan and would have been in use by many potters during that historic period. It is known as a noborigama in Japan. The nobori went to Japan from Korea. 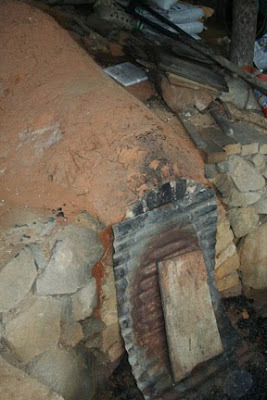 This photo is of a similar kiln being repaired. 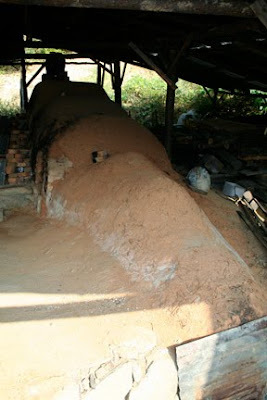 It is the oldest kiln in operation in Korea. 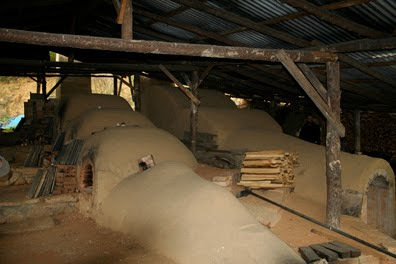 To learn more about this other amazing mangdaengi kiln and the important ceramic family that owns it, visit my other blog dawan-chawan-chassabal.blogspot.com. The interior arch of Park Jong Il's mangdaengi orumgama. 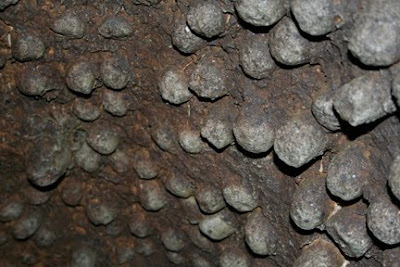 The interior dome of the mangdaengi. 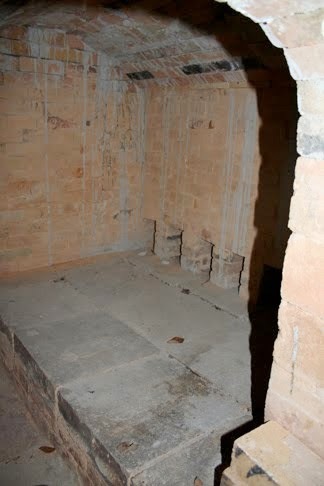 The interior of one of the chambers. 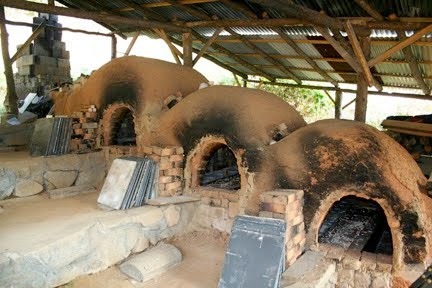 Note, traditionally no shelves were used in these kilns. That is why tea bowls were stacked inside each other. 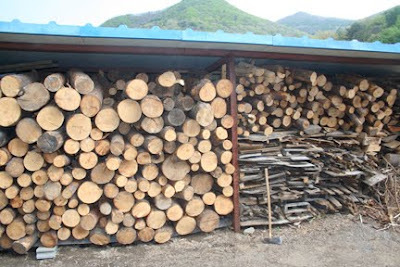 Recently Park Jong Il built a second kiln. It is also an orumgama but is made of commercial brick. 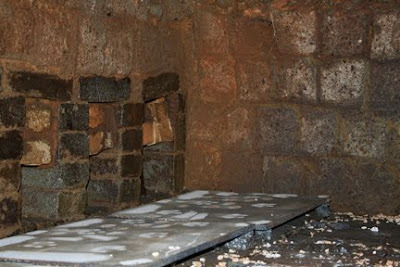 As you can see from this photo both kilns were covered with a castable refractory coating to provide extra insulation and more protection from the weather. I can't leave this post without showing you the interior of the new kiln. This is the fire box. 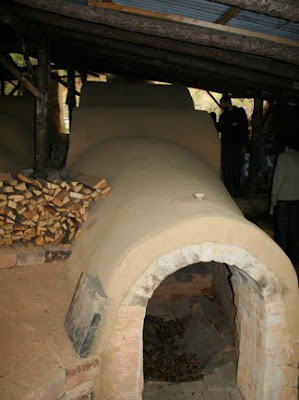 Compare Jong Il's two fire boxes with the old mangdaengi kiln in Mungyeong. 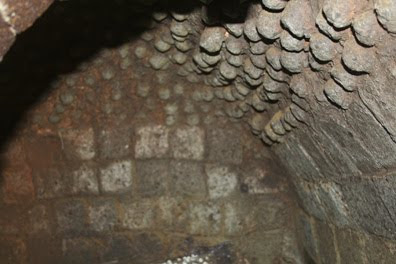 The interior of Jong Il's new kiln showing the dome of the orumgama. The look of the older mangdaengi gama is rather romanic and rustic, appealing to our aesthetic senses, but protecting the kilns is important. On a recent phone conversation with Park Jong Il he told me that he had about 50 cm of snow. This blog on our friend Park Jong Il is an outgrowth from our MorningCraneTea.blogspot.com blog. Park Jong Il has reached a level of international appreciation that he deserves his own blog in English. I hope that this blog on Park Jong Il is interesting as much to those of you who are ceramic artists as to those of you who are tea connoisseurs. We should share similar interests. A more in depth look at a tea ware artist such as this may help those who drink tea identify more with what it takes to make that small cup or teapot you are using. We began Morning Crane Tea for that purpose. Our blog posts are not just about tea or teaware but provide considerable information on Korean tea and links to other sources. Another great source for information on Korean tea is Matt Cha's blog. You may have to search through his earlier posts to find the posts on Korean teas but it is worth the search and all his posts are interesting. Before I leave Park Jong Il's kiln, you should know that before each firing, Jong Il places a small cup above the opening of the fire box. In it is some tea, soju or even makgeolli. It is an offering to the gods of the kiln for a good firing. Many potters also bathe before the firing. It is a way of preparing oneself to be properly attentive and to consider the firing event an occasion worthy of one being at their best. In the West we become disappointed if we lose a pot or two because of a cracked foot or the glaze didn't develop properly. In Korea it is not uncommon for a potter to lose between 40% and 70% of their work. The percentage of loss is even higher for celadon. I remember a TV program on a tea bowl artist I saw in Korea. The program followed a potter and his son as they worked for several weeks preparing the wood and creating the ware. Then they loaded and fired the kiln. The firing was a total disaster. The final scene was their breaking every piece in that firing because nothing was acceptable. This experience did not deter those potters but gave them greater resolve to continue in their work - a quest for a better chawan. To many who drink tea, tea cups, tea pots and tea bowls are just containers for tea. To a Tea ware artist, they are a way of life. It is also true that to many ceramic artists, tea is just a drink, but to Tea connoisseurs Tea is also a way of life. My hope is that these blogs will in some small way bring our two worlds closer together.